One of the most praised PC RPGs of 2011 finally makes its way to the Xbox 360. We've praised Witcher 2 on PC for its truly mature world and story, renewed pacing and improved combat from the original, and of course, the amazing visuals that still hold up as some of the most impressive we've seen to date. 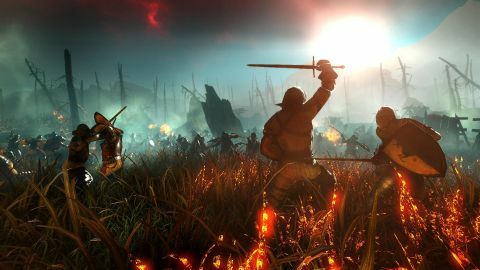 Witcher 2 on 360 provides the same experience from the PC version, only with a few slight changes to accommodate the console and a few welcome additions. Geralt of Rivia is a Witcher - a mutant monster hunter with magical powers, silver hair and so many scars that chicks probably don't dig it anymore. This sequel starts off right after the events of the first game with Geralt having saved King Foltest of Temeria from a mysterious assassin, been hired as a gloried bodyguard and then framed for said king's regicide. Geralt must clear his name, catch the true assassin and solve any well paying citizen's problem as he faces the poverty ridden, racially tense, and monster infested world. Geralt's world is an unforgiving one filled with bickering nobles, downtrodden peasants, and racially abused "non-humans" (elves and dwarves). CD Projekt spared no attention to detail creating believable environments to explore. You'll see townsfolk go about their daily lives chopping wood, butchering meat, and selling goods at shops. Drunks stagger outside taverns, whore houses are thriving businesses, hangings are common place and interacting with townsfolk and major characters is just as colorful. The “F” word gets tossed around like nobody’s business, dialogue is as hilarious as it is vulgar, and the “romance” scenes put Mass Effect’s soft-core love to shame. It is easy to get lost in the world they've created, especially one so gritty and unapologetically vile. As can be expected, The Witcher 2 doesn't meet the jaw dropping visuals of the PC version and, unfortunately, not that of Gears of War or other console exclusives either. Graphical detail and resolution took a hit, and we saw the occasional muddy texture and some spotty lighting showed up here and there, but these small shortcomings never brought out of the experience or kept us from enjoying the adventure. The Witcher 2 is far from ugly , but if you want the best visuals gaming has to offer, keep saving up for that PC. If you just want to experience an awesome RPG from your living room, the 360 version will do just fine. Anyway, the greatest draw in The Witcher 2 are the ways Geralt can affect the world through the story. For those who are attracted to the choose-your-own-adventure style storytelling from games like Bioware's Mass Effect or Dragon Age, you are in for a treat. Geralt is constantly posed with decisions that literally change his path in the game and the course of history in the world. These choices aren't as simple as choosing the angel on your right shoulder or the devil on the left. Many of them result in unforeseen consequences and can lead to polarizing branching storylines and multiple endings. There is no clear cut, black or white situation or character, more just taking sides of a conflict; comrades have ulterior motives, bandits strive to free the downtrodden, and righteous leaders can turn out to be political puppets. Everything is grey, making every decision that much harder to choose. But to that end, the Witcher 2 succeeds gloriously in making us feel invested in every choice we make. Beside the immersive world and engaging storytelling is robust, challenging, action-packed combat that is supported by all the things RPG lovers love: deep crafting, leveling, and inventory management systems. Geralt has an arsenal of traps, bombs, potions, swords and armor that can be crafted, upgraded and modified to fit specific combat situations. Jumping head first into a battle will often get you killed, so gathering ingredients beforehand, laying traps, crafting special bombs and drinking stat boosting potions becomes a necessity. Geralt can exploit enemy weaknesses by coating his swords with various oils to boost damage or gain status effects, or protect himself by drinking potions to counteract harmful effects like poison or bleeding. There's no get-out-of-jail-free health potions or aid available during combat and no amount of preparation guarantees victory. When Geralt is out in the wilds staring down a horde of Nekkers or the massive Kraken-like boss, the Kayran, all of the careful preparation, crafting, and sword polishing comes into play with intense, active combat. Once we got used to the sticky controls, and earned the essential upgrades from our skill tree, we were chopping up enemies, dodging, blocking, and casting Aard force pushes like we were some kind of medieval Jedi. Having our set traps, disabling bombs, and good ol' fashioned swordplay work together as a perfectly planned strategy is amazingly satisfying and exhilarating, especially knowing that one second of carelessness can quickly turn a fight. Unlike at the PC version's launch, the Enhanced Edition is now much easier to get into with the optional full tutorial mission that takes you through the ins and outs of the combat, crafting, inventory management, and environment interaction. The most welcome addition takes all of the guesswork out of getting thrown in the deep end and carefully explains all of the essential systems and even breaks down how to use Geralt's magic signs. All new missions have also been added that add a few extra hours of gameplay, lets you meet new characters, and ties up a few loose ends. The Witcher 2: Assassins of Kings is probably one of the best RPGs you'll play this year (if you haven't already). The immersive world, memorable characters, exhilarating combat, and branching storylines will have you coming back to play it again and again. CD Projeck Red seems to have put a lot of TLC into its beloved Witcher series and have delivered an even more complete package (adding the new tutorial, quests, and cut-scenes) than was available at The Witcher 2's original release. If you haven't played this brilliant RPG, dedicate you're next thirty hour gaming binge to the Witcher 2. You won't regret it. Truly a labor of love, this amazing sequel fortifies the foundations laid down by a flawed classic and creates a brilliant masterpiece. Visceral combat, dizzying player customization and a truly immersive story all come together to create one of the best role-playing experiences of the year.